Ilford Washaid is a hypo-eliminator formulated to shorten the wash times of all ILFORD films and fibre papers, saving both time and water. It is particularly useful if a hardening fixer has been used. A one liter bottle of concentrate makes enough solution for processing up to 200 8x10 prints or 200 135mm 36 exposure films. 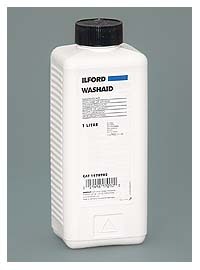 For detailed information on Ilford Washaid, please refer to the Technical Information PDF.